Impact Stories — Change Agent Network, Inc. This month June 2015, we bring you the Impact Story of one of our Pioneer Volunteers. James B. Toe has demonstrated a true spirit of volunteerism. It is quite humbling to see and feel a new form of enlightenment in a young African leader impacting his society and people. My name is James B. Toe. I was born on the July 17th 1983, in Harper-Maryland County, Republic of Liberia. Out of five children, I am the second to the last born. As a child growing up, my parents Henry and Jessie Toe and I were forced to flee Liberia into exile due to the civil war. Because young people of my age were the target for combat recruitment with the rebel groups. We arrived in Nigeria in August of 2002 when I was at the age of 18 with my parents. During that same time, I started volunteering with Change Agent Network in the Oru Refugee Camp in Nigeria, West Africa. My father Henry Toe died in the Nigerian refugee camp from a protracted sickness with no hope of healing. My mother Jessie Toe and I including my younger brother and sister returned to Liberia in 2008. Two years later, my mother also died after suffering from a growth in her stomach for five months, with no hope of survival because of a non-existing health system in the entire country. I met Mr. Eric Wowoh in 2002 the same year that we arrived in the Nigerian camp through my late father. My father and Eric became good friends in the camp after interacting for a while at a local teashop where they use to regularly meet to play checker game together. Though Eric had not seen me before, he agreed to take care of me. After I returned home that evening, my father asked me to take a walk with him. My father and I walked together to Eric’s home in the camp and met Eric for the first time. My father introduced me to him and he told me that Eric was now my new adopted father. Since then, I lived with Eric and considered him my father till this date. Currently, I have one brother and three sisters. Currently two of my sisters are living in Monrovia and the other two siblings are living in Harper, Maryland County. Basically, we are five children three girls and two boys and right now I am the breadwinner and the only source of support for them. Liberians have never had a foundational plan for the next generation. Everything has been about self, that’s the reason why everything in Liberia is underdeveloped. The roads, houses, businesses and communities overall lack infrastructure and are impoverished. That must change and we must be the ones to change the story. Remember that our generation is a struggling one and if we focus on just bettering our lives, the future of the young ones cannot be brighter. This calls for sacrifice on our part. We must sacrifice to save the next generation of Africans. Only selfish people don’t have time to sacrifice for the betterment of other people. But also remember that Jesus himself sacrificed his life for us to have freedom. Jesus never came to die for himself, but for the next generation, and the next generation he died for is you and I. We may not literally give our lives to save the next generation but we should work to better things for them. Change Agent Network is unique in many ways. The organization is not about us and therefore it is not centered on any of our interests, but in the interest of the next generation. We started with just one desktop computer that was given to Eric W. Wowoh in 2001 as a gift. The organization began with a core principle of volunteerism and giving back. This whole idea of giving back and seeking the interest of others especially the next generation, started with Eric when he decided to open his home and start computer classes. After I received the free computer training from Eric, I decided to voluntarily give back to others free of charge as well. 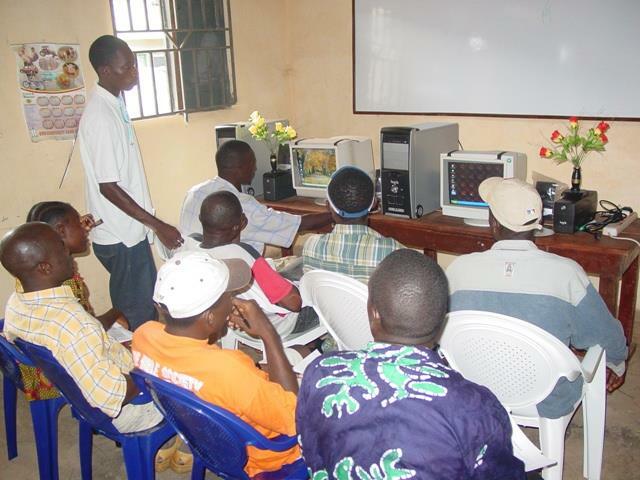 As a young refugee, computer skills were valuable and afforded me a great job opportunity in Nigeria. I could have moved on into the mainstream Nigeria society to make money for myself with my computer diploma. But I was inspired by Eric’s commitment to helping people by giving them hope and opportunity. I decided to follow Eric’s leadership and self-sacrificing life-style. My experiences with Change Agent Network over the years, has been basically about sacrificing oneself for others and especially the next generation. Such a self-sacrificing lifestyle has had a profound impact on me and has built me into a leader that I never thought I could be. 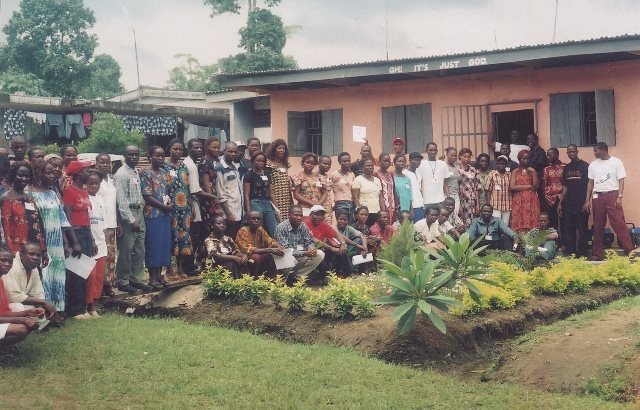 I am currently serving as Director of Change Agent Network at the Alexandria A. Andrews Academy Elementary, Junior and Senior High School in Gbarnga, Bong County, Central Liberia From a desktop computer in the refugee camp, the organization has grown today into an International organization. In Liberia alone, the organization has extended its educational programs and service projects to four counties in the country. Change Agent Network has impacted so many people’s lives in Liberia and other parts of the world. Our program is diverse in terms of focus and benefits. We have our educational program that has three core focus areas, primary and secondary education, technical education, and spiritual and leadership development. We also have our sustainable livelihood program where we have built homes for homeless families and engaged with rural women in agribusiness. Additionally, we have our global networking program that continues to build relationship amongst and between people of different nations. Now you see the huge impact of the organization – thousands have benefited and many more will continue to benefit. When I graduated from the computer school in 2003, like many other refugees that left the refugee camp in search for greener pastures, I had the opportunity to find work in the Nigerian job market. But I decided to deny myself so as to help my brothers and sisters in the camp. That spirit of volunteering for the next generation is inherent in me now even as I travel to the United States of America in a few weeks time from today. Yes, by God’s grace I will be traveling to the United States very soon through the American Government’s Diversity Green Card Visa Lottery Program. Normally, people are being influenced by their peers and the things around them. I had been influenced a long time ago to abandon my commitment to this worthy cause when things were rough and tough and Change Agent Network was nothing but just a glimpse of hope. But you can see that after 13 years of amazing accomplishment, I am stilled committed. All of you are the reason why some of us in Liberia have continued to hang in there and have hope today, because without you, we could not have accomplished these successes over the years. I want to encourage everyone to keep volunteering his or her time, providing resources and sacrificing for the next generation. Keep in mind that this is not about us it is bigger than us. Remember: “The true beauty of life does not depends on how happy you are but how happy others are because of you”. To our American Partners here I come, thank you so much for the support over the years. You are a true family in a distant land. To the Liberians, this is about us; let us all embrace the change. No one else can build Liberia for us than ourselves. As our friends and partners continue to help us, let us come together and develop our motherland. To all of our partners around the world, your contributions and donations have had, and continue to have, a profound impact on the lives of many poor families and children in Africa. Thanks and may you continue till the last poor individual in Africa is rescued from poverty. Once again I say thank you! In conclusion, we have lost our generation to a senseless war but we now have the power in our hands to change Liberia for the better, let us use it. I want to see Change Agent Network as a Global Organization that operates in more than 100 countries in the next 20 years. Finally I say, join the movement for change in Liberia and Africa. Join Change Agent Network.